District Cooling Market size in 2017 was valued over USD 100 billion and the annual energy consumption will reach over 300 PJ by 2024. Increasing regulatory measures toward carbon emissions coupled with rising cooling demand will foster the district cooling market size. Introduction of government norms and mandates along with ongoing adoption of sustainable technologies will stimulate the industry growth. The EU introduced an initiative (COM (2016) 51 final) with an aim to reduce the energy dependency across the EU nations. Further, the initiative also proposes plans toward reducing the greenhouse gas emissions from commercial and residential establishments. 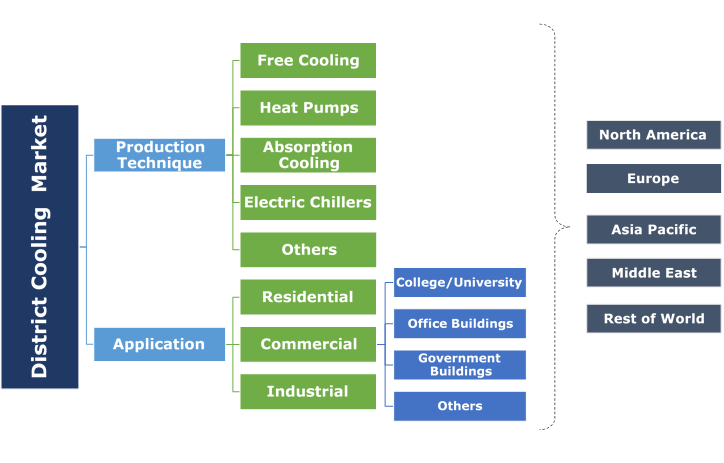 Extreme climatic conditions owing to increasing surface temperature along with growing energy consumption in Middle East and Asia Pacific region will propel the district cooling market share. Rapid urbanization and industrialization on account of increasing per capita income and improvement in standard of living will positively influence the product adoption. In 2016, the maximum temperature across Kuwait was recorded at 540 C which was 8% higher when compared with the 2015 levels. Economies of scale in long run, ease of parity with various production technologies, flexibility and reliability of systems and high standard of operations and maintenance are some of the key features which will encourage the product penetration. 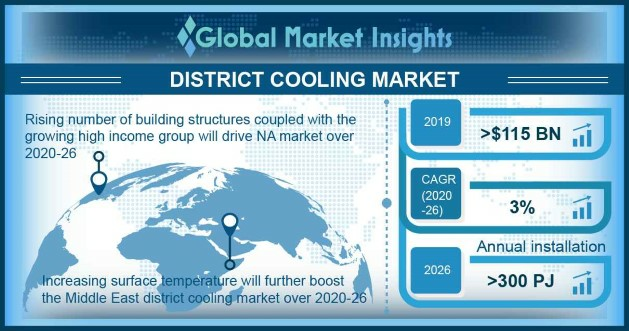 In addition, rising infrastructural spending across the emerging economies on account of developing commercial sector will stimulate the district cooling market. Free cooling technology is set to grow on account of stringent regulatory norms toward reduction of dependency on fossil fuels. The technology adoption is influenced by reduced emissions owing to decline in peak power demand, increasing adoption of sustainable energy and reduced need for infrastructural expansion. Growing deployment of projects by utilizing lake and sea water to reduce the emissions will further boost the district cooling market. Absorption cooling technology in 2017, accounted for over 13% in 2017 of the global district cooling market share. Ability to use waste energy for cooling production and environment friendly nature will favor the product adoption. Increasing demand for energy efficient technologies favored by stringent environmental norms will positively influence the business growth. Reduced power requirement and decreasing carbon emissions are some of the key features which will complement the industry outlook. Residential district cooling market is set to grow owing to growing demand for efficient and sustainable cooling solutions. Increasing penetration of small scale DC systems will boost the product demand. In 2016, Westpoort Warmte and AEB initiated a DC project in Amsterdam to provide services to residential buildings in the city. Commercial district cooling market is anticipated to grow over 4% by 2024. Increasing adoption of sustainable building codes and standards coupled with development of efficient building systems will encourage the product penetration. Ongoing investments toward the real-estate business on account of flourishing service sector across the Europe and Asia Pacific region will further stimulate the business outlook. In 2017, the real-estate investments across commercial sector accounted for USD 32.4 billion, an increase of around 35% when compared with 2016. U.S. district cooling market will grow over 2% by 2024. Increasing demand for cooling owing to growing investments toward commercial and residential development will positively impact the business growth. Stringent government norms toward carbon emissions along with ongoing adoption of sustainable energy efficiency standards will positively influence the business outlook. The U.S. EPA in 2015, introduced the carbon emissions norms for new power plants. The initiative incorporates the NSPS standards to restrict the CO2 emissions from natural gas and coal-fired plants. Stringent regulatory frameworks toward decarbonization of buildings coupled with increasing penetration of clean energy technologies will foster the Sweden district cooling market. Torrid climatic conditions on account of the nation’s geographical presence near Gulf stream will further propel the industry growth. The average temperature recorded in Stockholm in summers was 22.40 C in 2016. Saudi Arabia district cooling market is set to exceed USD 1 billion by 2024. Rising demand for sustainable solutions coupled with increasing adoption of green building codes and standards will stimulate the product adoption. Favorable regulatory framework toward the adoption of large scale DC systems along with increasing construction spending across the major cities including Riyadh and Macca will complement the business growth. Key leading players across the district cooling market includes Tabreed, Emicool, Fortum, Vattenfall, Veolia, Ramboll, Siemens, Engie, Alfa Laval, Goteborg Energi, Helen, Wien Energi, Logstor, Empower, Qatar Cool, Shinryo Corporation, Stellar Energy, ADC Energy Systems, SNC Lavalin, Singapore District Cooling and Keppel Dhcs. Ongoing investments toward extensive R&D activities along with numerous initiatives by industry players to enhance their presence has been a prominent strategic implication by leading players across the district cooling market. In addition, the shifting trend pertaining to development & customization of technology and expansion of facilities to cater the growing consumer base has been a focus point for key players. DC technology provides cooling solutions across the residential, commercial and industrial establishments. The chilled water is delivered from a centralized chilling plant to various buildings attached across the network. The water circulates in the cooling coils and enters the cooling network. The energy requirement to drive the technology is primarily produced from free cooling, heat pumps, electric chillers and absorption cooling. The product requires less power, are easy to maintain, low noise and efficiently controls the internal room temperatures when compared with alternative technologies.